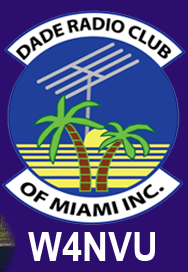 August 2008 Meeting Minutes – W4NVU – Dade Radio Club of Miami Inc.
Meeting was called to order at 19:53 with 18 present. John was not present tonight and Robert presided over the meeting. Robert welcomed everyone to the meeting. The meeting was broadcast live on the air tonight from the EOC. Testing was being conducted in the other room. The microphone was then passed around the room and everyone stated their name and call sign. Robert welcomed everyone again. We do not have a guest speaker tonight, but Ray has a presentation of various pieces of equipment that he started passing around for everyone to take a look at and he will explain later. The minutes for the June and July meetings were posted on the web. A motion was made by Chris to accept the June and July minutes, seconded by Esther. Voted and passed. Robert then spoke about the Radio Room at the EOC. Robert met with Rick Butler. They discussed the ARES/RACES program. We are headed in the right direction. He is still trying to get a copy of the MOU with Miami Dade County and DRC. They discussed training requirement. Each member will need to earn an ID through training and keep up to date to get one. The radio room is cleaned up quite a bit. Ray and Philipe also spoke about the meeting. Robert announced that Miami Dade College is in charge of the CERT program. They are working on a program for the EOC that would include HAMS. See Esther if you are interested in signing up for classes. Joanne announced that CERT had a refresher course this past Saturday and the USAR site. Steve was not present tonight so there was no discussion about the HAM trailer. Robert announced that the DCAT team is being brought back. On Sunday, August 24 there will be an SET. Go to Diasterops@aol.com for more information. They will be working with Robin in Broward for setting up some training – TBA. Ray spoke about the solar cells that he was passing around. They are available at Northern Tools for $44.95. Solar power was discussed by the members as well as other products and companies to purchase them. Robert asked about any other old business and there was none. Next, Robert discussed our Hamboree in October. With Esther’s help, the floor plan for the 200 tables is done. The flyers, website, testing site are done. There will be 65 tailgate spaces outside, parking for 400 cars, and the only Hamboree with a dock. One day only, October 25. Carl asked if we are being charged to remove garbage and Robert said he had it covered. The CAP kids are going to help us a lot. There is not going to be a lot of physical work. It will open on Friday, October 24 at 6 PM for move in to 9PM. Saturday, Oct 25 – 6 AM to move in and tailgate. Show starts at 8 AM and goes until 5 PM. Tables are $20.00 each in advance. You get a 30” x 8’ table with a hair. Tables against the wall are $25.00 each. Pre-sale date ends September 2?, 2008. Robert will let us know the exact date. After the pre-sale date, all tables are $25.00. We will have free Wi-Fi and he is trying to get a beer license. Hollis asked if there was going to be lunch for the workers working the Hamboree and Robert said it will be taken care of. Merritt spoke about the 147.000. Still works. The meeting message is on until Midnight. Those present thought it was cool. Ray spoke about the 146.760. It’s working fine. We are using it right now. He is in the mode of “if it aint broke” mode. Robert spoke about the 220.000. Not working. Carl spoke about the 444.200. It’s working fine and had to re-register the repeater. Ray announced that August 11 is the 10th Anniversary of South Florida Hams. Dave came into the meeting and announced that Arthur Prieto passed his General. Justin Atrio passes his Tech and has a 1 year membership in DRC. Congratulations to Arthur and Justin! With no other business, Robert thanked everyone for coming. A Motion to close the meeting was made by Chris, seconded by Randy. Voted and passed. The DRC meeting was adjourned at 20:43.